LOS ANGELES, Calif. — Robert M Smith, died peacefully Jan. 6, 2019, with family beside him. Born on Feb. 10, 1931 in Scobey, to Franklin Huston Smith and Margaret Hensel Smith, he grew up living on or near Indian reservations in Montana and Wyoming, as his father worked for the Bureau of Indian Affairs. While attending Hardin High School, he played center on the undefeated 1948 football team, and attained the rank of Eagle Scout. He studied at Montana State University where he was president of his fraternity, Sigma Alpha Epsilon, was active in ROTC and graduated with a B.S. in mechanical engineering. Upon graduation he served as an officer the US Air Force, stationed overseas in Tripoli, Libya. After he retired from active duty, he returned to Billings where he married the love of his life, Lee Combs Smith in 1957, and began his career with Burroughs Corporation. They raised two children, Scott and Lisa, and moved around the country to Chicago while Bob rose at Burroughs as a sales executive and they moved several times with his job- to Chicago, and then to Atlanta. By 1975, he knew he wanted to be an entrepreneur and moved his family to Scottsdale, Arizona where they opened 8 different Kwik Kopy Franchises in the Scottsdale/Phoenix area. He served as a member and president of the Sunrise Rotary Club of Scottsdale and was a Paul Harris Fellow award recipient. After selling all of the printing operations in the 1990’s, he and Lee opened 2 consignment furniture stores in San Diego, where they enjoyed living on their boat. He was passionate about flying, fulfilling his dream of getting his private pilot’s license in 1983. He loved fishing, whether it was fly-fishing in the rivers of Montana, or deep sea fishing in the shores off Mexico. 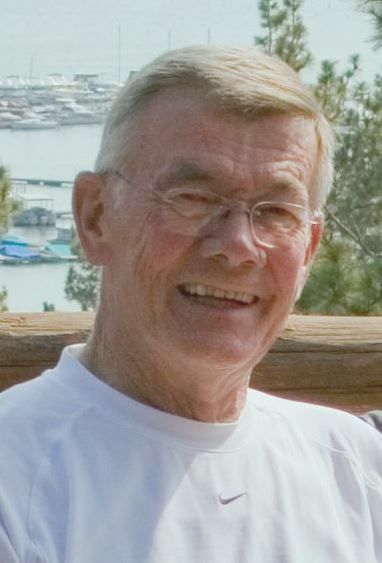 He was an avid hunter, and enjoyed elk hunting trips well into his 80’s. Among the many wonderful qualities Bob had, it was his sense of humor, his undying positive attitude and his easy-going calm manner that stand out. He and Lee had a beautiful marriage built on love and humor that inspired so many. Bob was very devoted to Lee, who died 10 years ago after their 51st wedding anniversary. Also known as Grandpa Bob, GBob and Grampy, he was actively involved in the lives of his 5 grandkids. Over the last decade, he divided his time between Scottsdale, Billings, and Los Angeles, where was he was living before he passed away. He is survived by son Scott Smith; daughter Lisa Smith Leight; grandchildren Spencer, Carter and Parker Smith and Abigail and Nathan Leight; daughter-in-law Tracy Smith; sister Patricia Smith Bruggemann; devoted family friend Stephanie Leavitt, and many nieces and nephews.